Over a month later, and I still haven't made progress towards getting a camera. I've been distracted by several things, including doll pants (yes, more doll pants!) and dog-sitting. I just got home from a 17 day sitting job with the world's sweetest old baby boy, and when I wasn't snuggling him, I was using my sewing machine in the basement of his house. Mia, one of my latest rescue dolls, tagged along to be my model. Luckily, I still have some doll photos in my archives, and I thought I'd share more of these today. Here are a few of my girls wearing some of the earliest versions of the elastic waist skirt-turned-dress. From left to right, here are Lila, Rachel, Mona, Elisa and Jenna. Each dress is made of cotton quilting fabric that I purchased from The Idea Store, my local creative reuse center. Also featured are Idea Store ribbons and lace, and even though you can't see it, the elastic is secondhand, too. This is how I'm able to buy so much fabric without going broke! Here are Jenna and Rachel, posing for a closeup (Rachel mostly wanted to show off her cute short hair). Right after this photo was taken, I decided that the daisy dress needed a little something extra, so I hand-sewed some black sequins to the bottom. This also covered up the shoddy job I did attaching the lace. I don't have any formal training in sewing, and I'm learning all the time. Slowly. At this point I've made enough of these dresses to realize that they look best when they're shorter and when the strip of fabric is wider. The narrower the elastic casing, the cleaner the look, and a loop turner is the perfect tool for getting the elastic through when safety pins are just too big. The back seam needs to be pressed, and I use something called a ham to make the job easier. The name always makes me laugh. I still need to work on the construction a little. If I can keep it from getting too bulky, I'd like to do the back seam as a French seam instead of a pinked edge. And I really, really need to practice the technique that Uncle John taught me to make those impossibly tiny hems, because mine are anything but. That said, I like this style because it's so easy; all the sewing is in straight lines! If you can make an elastic-waist skirt, you can make this dress. It can also be made into a one or two-sleeved dress or shirt with just a few little modifications. I plan to make more of these now that I'm home, since I have pounds and pounds of fabric waiting to be used. Peasant tops will go really well with all those pants. That's all for now! Stay tuned for more pretty gals and sewing experiments. And... anything else I have in my photo archives. Your dresses are really sweet. 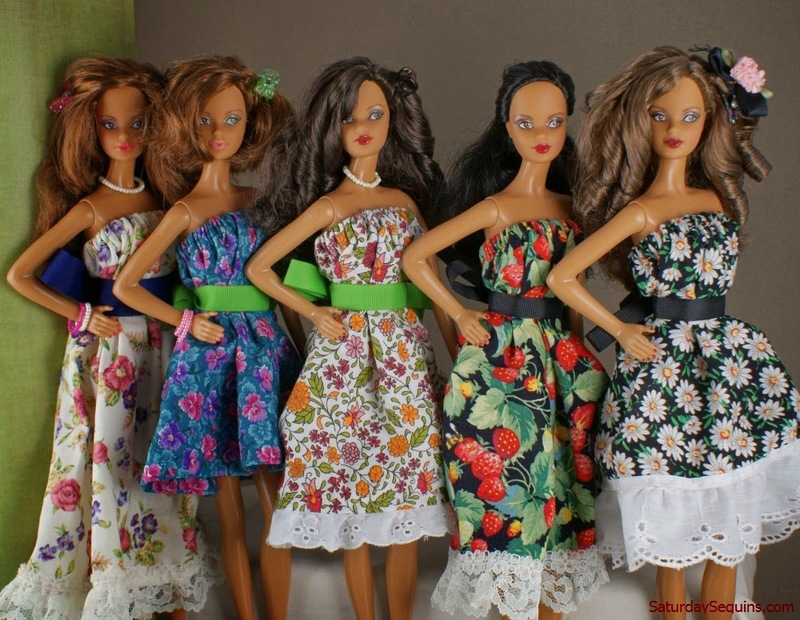 The prints are in perfect scale with the dolls and everything looks so fresh and spring-like. I'm sure your girls can't wait for the warmer weather!!! 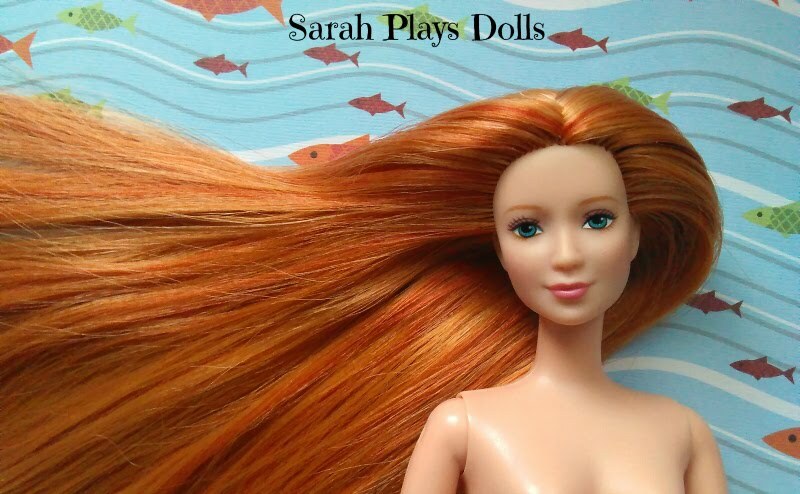 April, thank you for your kind words and for being the very first commenter on my doll blog! The girls are very excited for Spring. And for the doll garden I'm planning for them, where they can have tea parties and talk about scandalous things.